Introduction: In spite of a large number of drugs showing anti-hyperglycemic activities, none of them have been successful in complete management of diabetes mellitus (DM). Yoga and Ayurveda are the two schools of thought in India, which have a history of curing diseases since thousands of years. Yogic techniques and Ayurvedic herbs have proven their anti-diabetic potential without inducing untoward effects. The present study combines Ayurvedic medication with Yoga techniques as a new approach toward healing DM. Aims and Objectives: To assess the effect of Yoga therapy in the management of non insulin-dependent DM (NIDDM) and to decrease the oral drug dose requirement of guḍŪcī ghana Tablet. Materials and Methods: Thirty known NIDDM patients of both genders, who were on guḍŪcī ghana (solidified aqueous extract of Tinospora cordifolia (Willd.) Miers.) tablets from past 2 months as Ayurvedic remedy for DM were selected. Along with guḍŪcī ghana administration, the subjects were instructed to follow Yogic procedures including Āsanas , prāṇāyāma, and śuddhi kriyās . The study was conducted for 8 weeks, wherein fasting blood sugar (FBS) and postprandial blood sugar (PPBS) levels along with relief in sign and symptoms were assessed at every 2 weeks intervals, and according to relief in sign and symptoms, tapering of drug dosage was carried out. The obtained data were analyzed statistically by applying paired t-test. Results and Conclusion: The results obtained were promising as the relief in diabetic symptomatology was highly significant in terms of P value. 80.83% reduction in dose of guḍŪcī ghana tablets and 7.85% and 8.78% fall in FBS and PPBS levels, respectively, after the complete course of treatment. The obtained P value showed highly significant results. The highly stressful life in the current age has led to many lifestyle disorders like diabetes mellitus (DM) that affects almost every system of the human body. Disappointingly, to manage diabetes without side effects is still a challenge. Diabetes is a chronic metabolic disorder due to absolute or relative deficiency of insulin secretion with/without varying degree of insulin resistance. , In the current fast-track lifestyle of people, factors like dietetic incompatibilities, , stressful living, and sedentary lifestyle leading to reduced physical activity  have been blamed to influence the manifestation of the disease. Non insulin-dependent DM (NIDDM) is considered in Ayurveda as madhumeha, which is a Tridoṣa predominant disease commonly manifested with prabhŪta āvila mŪtratā (increased frequency and turbidity of urine). A significant amount of work is going in the field of epidemiology, genetics, molecular biology, and synthetic chemistry to find out alternative strategies to fight against diabetes. According to American Diabetes Association, the total costs associated with diagnosed diabetes have risen to $245 billion in 2012 from $174 billion in 2007, representing a 41% increase over a 5 years period. The World Health Organization (WHO) is urging health decision makers to develop effective management strategies to halt the rising trend of DM through trouble-free and cost effective treatment modalities. Recent studies also prove that poor diabetic victims are more prone to complications as they have lesser access to quality health care. This presents an alarming picture and a cost effective, and intelligent healthcare strategy is needed now to stem the rise of DM. It seems as though only herbal medications along with Yoga therapy fulfill this need as both healing methods are safe and cost effective to all sections of society. Yoga includes various health promoting tools such as āsanas (postural exercises), prāṇāyāma (breathing exercises), and śuddhi kriyās (cleansing procedures) that work on all aspects of the person: The physical, mental, emotional, psychic, and spiritual. These days, Yoga is often projected as an exercise only. However, significant physical, physiological, psychological, and endocrinal changes have been reported in people following various Yogic regimens over a period proving its efficacy in diabetes. , Though both Yoga and medicine help alleviate the suffering associated with illness; Yoga is also a preventive medicine par excellence. Nevertheless, no work is reported till date to assess whether Yoga regimen along with Ayurvedic medication can be helpful in drug dose reduction in diabetes, and if helpful, then to what extent. Considering all these points, the current study was planned to explore certain leads toward a simple and cost effective treatment modality for diabetes. Thirty NIDDM patients (males-19 and females-11) attending outpatient department and inpatient department of Rasa Shastra and Bhaishajya Kalpana Department, Gujarat Ayurved University, Jamnagar, from October 5, 2011 to April 31, 2012; who fulfilled the inclusion criteria were included. Patients were on medication of guḍŪcī ghana from past 2 months. A short clinical proforma was prepared which included the present and past medical history of first degree relatives, medications, diet pattern and lifestyle etc., of patients in the light of etiological factors explained for madhumeha in Ayurvedic classics. The study was registered under CTRI (CTRI/2012/01/002368). Specific scoring pattern was made for obtaining data about signs and symptoms [Table 1]. Patients with classical symptomatology of madhumeha, as well as type-2 DM,  were selected for the present study. We chose those subjects whose fasting blood sugar (FBS) and postprandial blood sugar (PPBS) blood sugar levels could be maintained at ≤ 126 mg/dL and ≤ 200 mg/dL, respectively, with the help of guḍŪcī ghana tablets orally, three tablets, 500 mg each, twice a day with Lukewarm water, half an hour before meal. The patients between age group of 30 and 70 years were included in the study. Patients having insulin-dependent DM, severe diabetic complications: Microvascular (retinopathy, neuropathy, and nephropathy) or macrovascular (coronary artery disease, peripheral vascular disease and cerebro-vascular disease), pregnancy, lactation and known case of tuberculosis, AIDS, and malignancies were excluded. Standard criteria of national diabetes data group and WHO for DM were adopted (these criteria are also adopted by the American Diabetic Association),  and blood glucose level was estimated in all patients. In this open clinical trial, all the patients were of middle-income group, literate, and from both urban and rural areas. They were advised suitable diet and lifestyle (pathya-apathya) in diabetes. Selected patients were instructed to perform prayer (Shānti Mantra) and rotation/stretches (rotation of body joints, just like a warm up exercise before Yoga practice) followed by five āsana, three prāṇāyāma and two types of śuddhi kriyā. To finish the session, patients were advised to perform prayer again. The schedule of Yoga sessions is detailed in [Table 2]. Every session of Yoga was conducted in the morning hours between 7 and 8 a.m. under the supervision of an expert Yoga instructor and received personalized attention and supervision for the duration of 8 weeks. Anuloma-viloma prāṇāyāma was advised for three rounds (9 times inhalation and exhalation = one round) as per classical reference. The duration of Kapālabhāti was gradually increased from 5 (at 1 st week) to 15 min (at 3 rd week), as it is not recommended to do this procedure for long time when one is beginning to do yoga. On achieving this ideal duration of Kapālabhāti (i.e. 15 min), all the procedures followed in the 3 rd week were continued for 8 weeks. Written informed consent was taken as per the Helsinki Declaration after explaining the study and its aims to the patient. They were kept on the same drug and diet control throughout the study before and after Yoga therapy. Doses of drugs were altered (decreased) periodically. 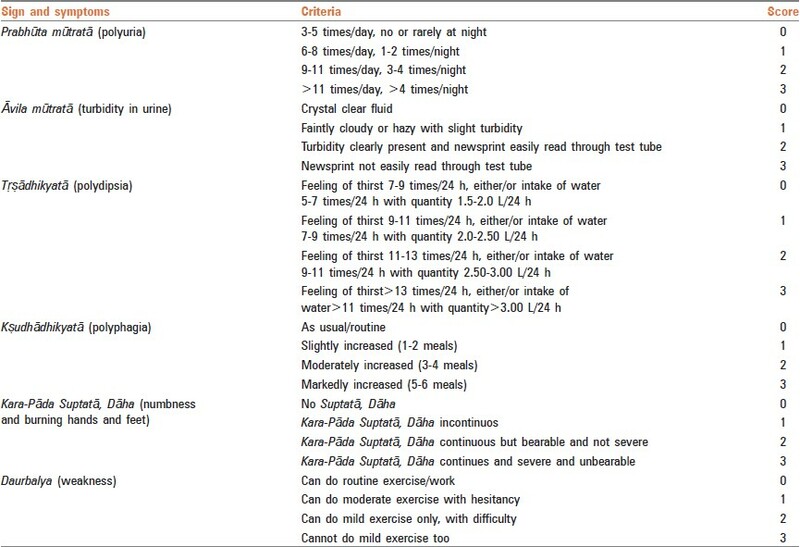 Scoring pattern of sign and symptoms is detailed in [Table 1]. Yogic procedures taught for 8 weeks are listed in [Table 2]. FBS and PPBS blood sugar levels testing were performed at 2 weeks intervals. According to relief in signs and symptoms of madhumeha, tapering of the dosage of guḍŪcī ghana was carried out. All the treated patients developed a feeling of well-being. Observations related to baseline characteristics of patients (age, gender, chronicity, family history, physical activity, mental stress, etc.) are depicted in [Table 3]. Data on drug dose reduction, FBS, and PPBS level testing performed at 2 weeks intervals are shown in [Table 4]. Statistically obtained results on clinical symptomatology as per scoring pattern, and the overall effect of therapy has been placed in [Table 5] and [Table 6]. P < 0.01 or < 0.001 - Highly significant. Of the 30 patients who enrolled in the study, all completed the study. All the patients were from Jamnagar district, Gujarat, India. No allopathic or other medicine was administered along with guḍŪcī ghana tablets during the course of the study. Paired t-test readings of before and after the Yoga sessions were taken and analyzed. Noticeable fall in the blood glucose level occurred due to the effect of Yoga therapy. Highly significant improvement was also reported in signs and symptoms of diabetes after 8 weeks regimen of Yoga āsanas along with oral herbal medication. The patients showed a sense of well-being within first 2 weeks, and there was lowering of dosage of oral medication. Dosage reduction was after questioning. On completion of the 8 weeks course, all patients developed a feeling of general well-being, alertness and attentiveness. Certain patients used to have reduced physical activity (56.67%). Most inhabitants of study region do not engage in any work between 1 p.m. to 4 p.m., and this can contribute to their madhumeha. Sedentary lifestyle is said to be predisposing factor for diabetes both in Ayurvedic and contemporary literature. , [Table 3] indicates that the subjects were facing various stresses that also triggers rise in blood sugar level. Most of the patients (63.33%) had chronicity of 5-10 years. This confirms the effectiveness of Ayurvedic medicine and Yoga therapy even in later stages of the disease [Table 3]. In Ayurveda, beside regular exercises, manual labor, walking, swim, run, ride, etc., are prescribed. ,, In addition to increased blood glucose level, dyslipidemia is associated in NIDDM patients. Exercise in diabetics can improve insulin sensitivity, glycemic control, and lipid profile. However, the intensity and duration of physical training required to decrease LDL and increase HDL cholesterol are not feasible in most NIDDM patients because of obesity, cardiovascular disease, and other age-related problems. , In such cases, Yoga Āsanas provide a better choice for sufferers. Āsana and prāṇāyāma reduce the overactivity of central and autonomous nervous system during all the stressful states. Due to various twists, stretches and strains in the body due to Yogic āsanas, the internal organs and endocrine glands are stretched and undergo strain. It increases the blood and oxygen supply to these parts and thus increases the efficiency and functioning of the endocrine system. Strengthening the immune system is also vital since some illnesses can cause the body to produce more blood sugar. Certain Yogic exercises activate the thyroid glands, massage the pancreas, stimulate nerve impulses to the pancreas and even affect the whole metabolism and provide healing energies of circulation and hence prove beneficial in the treatment of diabetes. The current study can provide a satisfactory and affordable approach in managing diabetes by building up a bridge between drug administration and Yoga therapy. It offers a safer approach of appropriate lifestyle intervention along Ayurvedic medication that could help the authorities to improve health conditions of diabetics. This is an unblinded study without a control group. This preliminary study should be followed-up by a controlled trial; the controls being selected by an accepted randomization procedure. Comparisons may be made between Yoga group and controls receiving Ayurvedic or allopathic medication alone without Yoga. The emphasis on outcome in future studies may be on glycemic levels, HbA1C and quality-of-life adapted to Indian context. The consorted approach of management explored by the present study may serve as a light of hope towards search of ideal treatment of DM. Relief in diabetic symptomatology was highly significant in terms of P values. 80.83% reduction in oral drug dosage and 7.85% and 8.78% fall in FBS and PPBS levels, respectively, were observed after complete course of treatment. The obtained P values show highly significant results. Present treatment regimen may counter the complex pathology of NIDDM, and it not only ensures good glycemic control when supported by diet and lifestyle prescribed for madhumeha, but also will delay its complications. Barar FS. Essentials of Pharmacotherapeutics. 4 th ed. New Delhi: S. Chand and company Ltd; 2006. p. 62-169. Devlin TM. Textbook of Biochemistry with Clinical Correlations. 4 th ed. New York: Wiley-Liss, Inc.; 1997. p. 34. Available from: http://www.womentowomen.com/insulinresistance/riskfactorsfordiabetes.aspx. [Last accessed on 2012 Jan 08]. Available from: http://www.diabetes.org/food-and-fitness/food/what-can-i-eat/fat-and-diabetes.html. [Last accessed on 2012 Jan 08]. Available from: http://www.diabetes.webmd.com/risk-factors-for-diabetes. [Last accessed on 2012 Jan 08]. Sushruta, Sushruta Samhita, Nidanasthana, Prameha Nidana Adhyaya, 6/6. In: Acharya VY, editor. Reprint edition. Varanasi: Chaukhamba Sanskrita Sansthana; 2010. p. 290. Available from: http://www.diabetes.org/advocate/resources/cost-of-diabetes.html. [Last accessed on 2012 Jan 08]. Secrest AM, Costacou T, Gutelius B, Miller RG, Songer TJ, Orchard TJ. Associations between socioeconomic status and major complications in type 1 diabetes: The Pittsburgh epidemiology of diabetes complication (EDC) Study. Ann Epidemiol 2011;21:374-81. Chakrabarti S, Biswas TK, Rokeya B, Ali L, Mosihuzzaman M, Nahar N, et al. Advanced studies on the hypoglycemic effect of Caesalpinia bonducella F. in type 1 and 2 diabetes in Long Evans rats. J Ethnopharmacol 2003;84:41-6. Sinha K, Mishra NP, Singh J, Khanuja SP. Tinospora cordifolia (Guduchi), a reservoir plant for therapeutic applications: A review. Indian J Tradit Knowl 2004;3:257-70. Bhattacharya SK, Satyan KS, Chakrabarti A. Effect of trasina, an Ayurvedic herbal formulation, on pancreatic islet superoxide dismutase activity in hyperglycaemic rats. Indian J Exp Biol 1997;35:297-9. Puranik N, Kammar KF, Devi S. Anti-diabetic activity of Tinospora cordifolia (Willd.) in streptozotocin diabetic rats; does it act like sulfonylureas? Turk J Med Sci 2010;40:265-70. Singh KP, Gupta AS, Pendse VK, Mahatma CP, Bhandari DS, Mahawar MM. Experimental and clinical studies on Tinospora cordifolia. J Res Indian Med 1975;10:9-14. Dhar ML, Dhar MM, Dhawan BN, Mehrotra BN, Ray C. Screening of Indian plants for biological activity: I. Indian J Exp Biol 1968;6:232-47. Bailey CJ, Flatt PR, Marks V. Drugs inducing hypoglycemia. Pharmacol Ther 1989;42:361-84. Acharya YT. Siddha Yoga Sangraha. Jwaradhikara. 13 th ed. Nagpur: Baidyanath Ayurveda Bhavan Limited; 2008. p. 4. Sharma R, Galib R, Prajapati PK. Validation of standard manufacturing procedure of Guduchi Ghana [dried aqueous extract of Tinospora cordifolia (Willd.) Miers] and its tablets. Ayurpharm Int J Ayurveda Allied Sci 2013;2:224-32. Sharma R, Kumar V, Ashok BK, Galib R, Prajapati PK, Ravishankar B. Evaluation of hypoglycaemic and anti-hyperglycemic activities of Guduchi Ghana in Swiss albino mice. Int J Green Pharm 2013;7:145-8. Sharma R. The effect of two different dosage forms of Guduchi, i.e. Satva and Ghana W.S.R. Antihyperglycemic effect on Madhumeha (NIDDM). M. D. Dissertation. Jamnagar: Dept. R.S. and B.K., I.P.G.T. and R.A; 2012. Patel C, North WR. Randomised controlled trial of yoga and bio-feedback in management of hypertension. Lancet 1975;2:93-5. Rugmini PS, Sinha RN. The effect of Yoga therapy in Diabetes Mellitus. Seminar on Yoga, Man and Science. New Delhi: Yoga Research Hospital, Vishwayatan Yogashram, CCRIMH; 1976. p. 175-89. Agnivesha, Charaka, Dridhabala, Charaka Samhita, Chikitsa Sthana, Atreybhadrakapiya Adhyaya, 6/14. In: Acharya VY, editor. Reprint edition. Varanasi: Chaukhamba Surbharati Prakashan; 2005. p. 446. Available from: http://www.medical-dictionary.thefreedictionary.com/diabetes. [Last accessed on 2012 Feb 01]. Fauci AS, Braunwald E, Kasper DL, Hauser SL, Longo DL, Jameson JL, editors. Harrison′s Principles of Internal Medicine. 17 th ed. New York: McGraw Hill; 2008.p. 338. Anonymous. Hathayogapradipika. Reprint edition. Pune: Kaivalyadhama, Shrimanmadhava Yoga Mandir Samiti; 2002. p. 40-2. Vagbhatta, Astanga Hridaya, Nidana Sthana, Prameha Nidana Adhyaya, 10/3. In: Paradakara HS, editor. 4 th ed, Varanasi: Chaukhambha Sanskrita Sansthana; 2010. p. 502. Nicki R. Davidson′s Principles and Practice of Medicine. 21 st ed. London Churchill Livingstone Elsevier; 2010. p. 802-3. Kato M, Noda M, Inoue M, Kadowaki T, Tsugane S, JPHC Study Group. Psychological factors, coffee and risk of diabetes mellitus among middle-aged Japanese: A population-based prospective study in the JPHC study cohort. Endocr J 2009;56:459-68. Malhotra V, Singh S, Singh KP, Sharma SB, Madhu SV, Gupta P. Effects of yoga asanas and pranayama in non-insulin dependent diabetes mellitus. Indian J Tradit Knowledge 2004;3 (2):162-7. Available from: http://www.onlymyhealth.com/benefits-kapālabhāti-pranayam-yoga-1331018320. [Last accessed on 2012 Jan 08]. Available from: http://www.xa.yimg.com/kq/groups/17922932/ 771800672/name/ASHTANG-YOGA-Book.pdf. [Last accessed on 2012 Jan 08]. Sahay BK, Murthy KJ. Long-term follow up studies on effect of yoga in diabetes. Diabetes Res Clin Pract 1988; 5(suppl. 1):55. Sahay BK. Yoga and Diabetes. In: Proceedings of Novo Nordisk Diabetes Update. Bombay: Ed. Anil Kapur, Publ. Health Care Communications; 1994. p. 159-67. Vagbhatta, Astanga Hridaya, Chikitsa Sthana, Prameha Chikitsa Adhyaya, 12/33. In: Paradakara HS, editor. 4 th ed. Varanasi: Chaukhambha Sanskrita Sansthana; 2010. p. 680. Vagbhatta, Astanga Hridaya, Chikitsa Sthana, Prameha Chikitsa Adhyaya, 12/37. In: Paradakara HS, editor. 4 th ed. Varanasi: Chaukhambha Sanskrita Sansthana; 2010. p. 681. Sushruta, Sushruta Samhita, Chikitsa Sthana, Prameha Chikitsa Adhyaya, 11/12. In: Acharya VY, editor. Reprint edition. Varanasi: Chaukhamba Sanskrita Sansthana; 2010. p. 453. Schneider SH, Ruderman NB. Exercise and NIDDM. Diabetes Care 1990;13:785-9. Skarfors ET, Wegener TA, Lithell H, Selinus I. Physical training as treatment for type 2 (non-insulin-dependent) diabetes in elderly men. A feasibility study over 2 years. Diabetologia 1987;30:930-3. Vanninen E, Uusitupa M, Siitonen O, Laitinen J, Länsimies E. Habitual physical activity, aerobic capacity and metabolic control in patients with newly-diagnosed type 2 (non-insulin-dependent) diabetes mellitus: Effect of 1-year diet and exercise intervention. Diabetologia 1992;35:340-6. Dang KK, Sahay BK. Yoga and meditation, Medicine Update. New Delhi: APICON, The Association of Physicians of India conference; 1999. p. 507-12. Uusitupa M, Siitonen O, Voutilainen E, Aro A, Hersio K, Pyörälä K, et al. Serum lipids and lipoproteins in newly diagnosed non-insulin-dependent (type II) diabetic patients, with special reference to factors influencing HDL-cholesterol and triglyceride levels. Diabetes Care 1986;9:17-22. Laakso M, Sarlund H, Mykkänen L. Insulin resistance is associated with lipid and lipoprotein abnormalities in subjects with varying degrees of glucose tolerance. Arteriosclerosis 1990;10:223-31. Kahn CR, Weir GC. Joslincs Diabetes Mellitus. New Delhi: B.I. Waverly Pvt Ltd.; 1996. p. 354. Available from: http://www.diabetesuffolk.com. [Last accessed on 2012 Jan 08]. Available from: http://www.diabetes.org/type-1-diabetes/stress.jsp. [Last accessed on 2012 Jan 14]. Analava M. Diabetes and stress: A review. Ethnomed 2008;2:131-5. Sahay BK, Sahay RK. Lifestyle modification in management of diabetes mellitus. J Indian Med Assoc 2002;100:178-80.